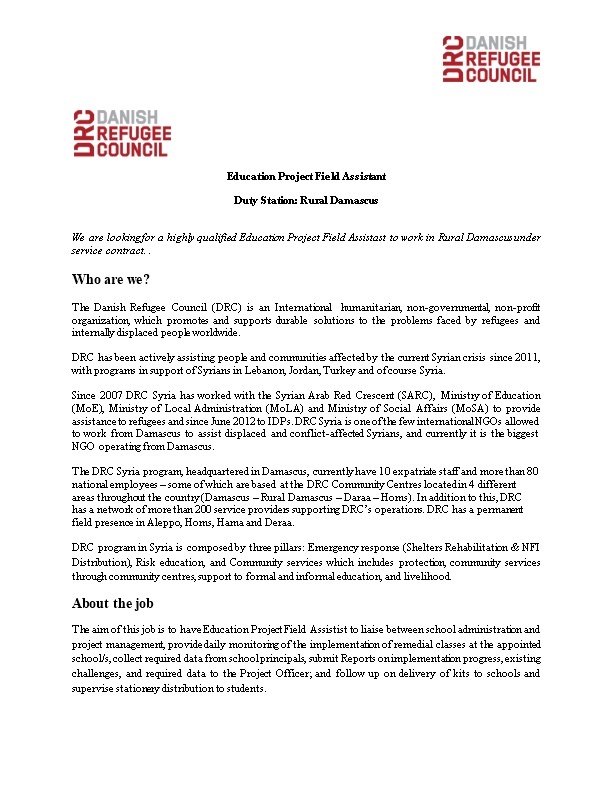 We are looking for a highly qualifiedEducation Project Field Assistast to work in Rural Damascus under service contract. . The Danish Refugee Council (DRC) is an International humanitarian, non-governmental, non-profit organization, which promotes and supports durable solutions to the problems faced by refugees and internally displaced people worldwide. DRC has been actively assisting people and communities affected by the current Syrian crisis since 2011, with programs in support of Syrians in Lebanon, Jordan, Turkey and of course Syria. Since 2007 DRC Syria has worked with the Syrian Arab Red Crescent (SARC), Ministry of Education (MoE), Ministry of Local Administration (MoLA) and Ministry of Social Affairs (MoSA) to provide assistance to refugees and since June 2012 to IDPs. DRC Syria is one of the few international NGOs allowed to work from Damascus to assist displaced and conflict-affected Syrians, and currently it is the biggest NGO operating from Damascus. The DRC Syria program, headquartered in Damascus, currently have 10 expatriate staff and more than 80 national employees – some of which are based at the DRC Community Centres located in 4 different areas throughout the country (Damascus – Rural Damascus – Daraa – Homs). In addition to this, DRC has a network of more than 200 service providers supporting DRC’s operations. DRC has a permanent field presence in Aleppo, Homs, Hama and Deraa. DRC program in Syria is composed by three pillars: Emergency response (Shelters Rehabilitation & NFI Distribution), Risk education, and Community services which includes protection, community services through community centres, support to formal and informal education, and livelihood. The aim of this job is to have Education Project Field Assistist to liaise between school administration and project management, provide daily monitoring of the implementation of remedial classes at the appointed school/s, collect required data from school principals, submit Reports on implementation progress, existing challenges, and required data to the Project Officer; and follow up on delivery of kits to schools and supervise stationery distribution to students. Represent DRC’s Quality Education (Q,E) project at the schools; reflecting thus DRC’s image and values. Conduct preliminary meetings with school staff conveying thus the project’s methodology of implementation, values, and messages. Ensure delivery of required project formats to schools, ensure completion of such formats by school staff on time, and collecting the information upon completion. Arrange for and attend meetings with school principals and teachers as requested or upon need. Conduct daily field visits to schools to ensure proper monitoring of activities. Attend classes and evaluate students’ interaction with teachers. Conduct exclusive meetings with students and take feedback. Ensure conducting pre-tests & post-tests on time and collect tests data. Assist in creating and developing the necessary formats, procedures, or operations to ensure proper implementation based on observation and feedback from students and school staff. Perform any other tasks requested by the QE project management. Provide half-monthly reports concerning the project’s progress and problems as well as the beneficiaries’ to the concerned superiors. Immediately inform the QE concerned superior of any out-of-the ordinary cases at schools including severe violations of the operational instructions and/or change of security status which threatens the safety of the beneficiaries or the school staff. Send collected data to Project Officer on time as requested via email. Suggest any improvements via providing feasible feedback based on field visits and schools’ needs on the ground. -Essential qualifications: Higher Institute or Bachelor’s Degree – Education related is a preference. - Essential experience: Previous similar experience with INGOs or UN Agencies, or teaching experience. - The applicant must have a laptop to be to get this job. Both must be in the same language as this vacancy note.CV only applications will not be considered.